Cost Factors for Solid and Pneumatic Skid Steer Tires, What is cheaper? General Skid Steer Tire Cost Factors and what to choose – solid or pneumatic tires? When deciding between solid or pneumatic tires for your skid steer, consider and compare the costs associated with equipping your skid steer with either option. Usually, the instinct is to go with tires that cost less. Solid skid steer tires cost you more upfront than pneumatic skid steer tires. This is because solid tires are made with more rubber; this makes them flat-proof and wear-resistant. On the flip-side, solid skid steer tires are heavier, putting more stress on a skid steer’s transmission and resulting in higher fuel consumption. The question is, which type of tire is the more cost-effective option in the long run? 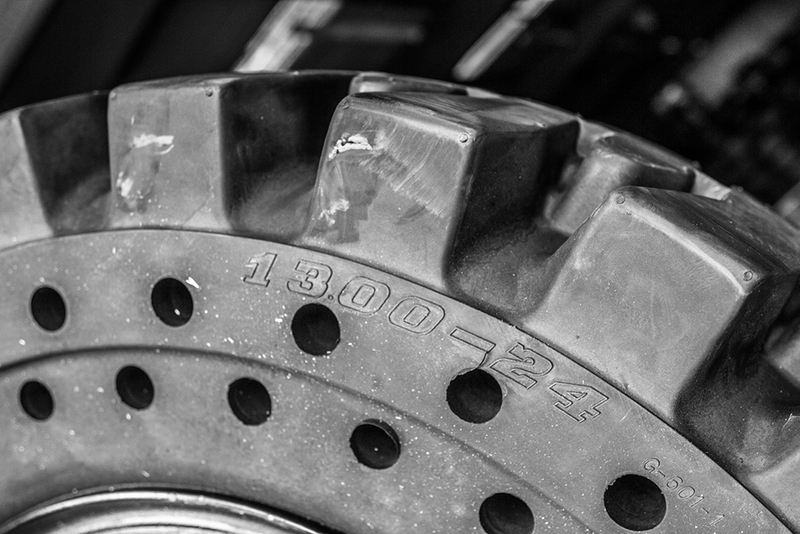 Solid tires will last much much longer than their pneumatic tire counterparts, and can operate on the most demanding job sites without getting damaged. There are a lot of factors to consider when determining which type of skid steer tire, solid or pneumatic, will maximize your ROI (return on investment). Let’s break down and compare the costs associated with investing in each type of tire. Solid tires will cost you more upfront than pneumatic tires. Hours of Machine Downtime: Solid skid steer tires are 100% flat-proof. That translates to zero machine downtime due to flats. Pneumatic, air-filled tires, on the other hand, are more prone to punctures and flats which increases incidences of machine downtime. Cost of Tire Repair: When a solid tire is punctured, slashed or cut, it can actually still operate. This is not the case with pneumatic tires. Once punctured, they have to be repaired. Cost of Tire Replacement: In the instance that the tires are beyond repair and need to be replaced, factor in the cost of buying new tires for your skid steer. Replacing tires happens more frequently when your skid steer is equipped with pneumatic skid steer tires because these tires are more prone to tire damage than solid skid steer tires. Productivity Lost from Machine Downtime: The time spent replacing or repairing tires translates to wasted productivity as the machine is not able to operate. Billing (hourly) for Machine Operation: For machine use billed by the hour, a flat can rake up costs for machine operation as considerable time is spent replacing or repairing damaged tires which means you usually get billed for more hours than you originally planned for. Number of Idle Workers: Machine downtime means that some of your laborers, who could be working, are left idle. This minimizes the efficiency and productivity of your operations. Workers’ Wages (hourly): It takes more time to accomplish a job when a tire is punctured. This increases the total amount of wages you pay to your workers who are billed hourly. Take this into consideration when investing in tires for your skid steer loader. By analyzing these factors before purchasing a set of tires for your skid steer loader, you will save yourself a lot of headache and money down the line. Typically, taking the above factors into consideration, solid skid steer tires offer a lower operating cost per hour than pneumatic tires. They outperform pneumatic tires in a range of key factors including durability, length of service life, maintenance, and wear. Monster Tires offers high-quality solid smooth and solid traction skid steer tires at the best prices you will find anywhere. Our solid skid steer tires are made from top-grade rubber and are capable of operating on the harshest ground conditions. For more information, contact us. This entry was posted in Monster Tires, Solid Tires. Bookmark the permalink.